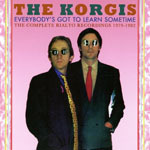 Share the post "Album review: THE KORGIS – Everybody’s Got To Learn Sometime (The Complete Rialto Recordings 1979-1982)"
There was a single released in 2006 by a latter-day version of The Korgis that was as exquisite as it was illuminating . ‘Something About The Beatles’ – originally a song they performed with art-prog rockers Stackridge – connected firmly with their roots and wistful thoughts of simpler times. Needless to say, that song isn’t on this 2-CD compilation which brings together the albums made for their own Rialto label between 1979-1982. But it does include the song by which they have been defined ‘Everybody’s Got To Learn Sometime’ a surprise and enduring hit in 1980 when it made No. 5 in the UK singles charts. The rich vein of British pop, including the Fab Four, the Kinks and even 10cc, is referenced by James Warren and Andy Davis who in 1978 were encouraged to work together again after Stackridge had imploded. The perfect antidote to the punk and New Wave era in which they found themselves, they fashioned pure pop tinged with the developing electronic synth sounds that were prevalent in this era. There are some standout tracks here including their other major hit single ‘If I Had You’, ‘Boots And Shoes’ and ‘All The Love In The World’. It’s all supremely crafted and an integral introduction to the work of two talented and under-rated songsmiths. The liner notes hint at the often fractious relationship between Warren and Davis. The latter had already left by the time of the third album – ‘Sticky George’ – although he contributed to three songs and remained in the background. The duo have reconvened in recent years when Stackridge and The Korgis have sometimes been interchangeable and their last set of live dates was in April 2015. This well annotated compilation brings together their three albums and two bonus pieces remixed by Trevor Horn but never available before on CD: ‘Don’t Look Back’ and ‘Xenophobia’. If they don’t add much to the Korgis canon, other than a big name associate, they do round out the band’s output over a productive four-year period. This entry was posted in ALBUM REVIEWS, ALBUM REVIEWS (Mobile), All Posts, INTERVIEWS, Radio interview, Reissues and tagged album, Andy Davis, compilation, Everybody's Got To Learn Sometime, interview, James Warren, pop, review, Stackridge, The Complete Rialto Recordings 1979-1982, The Korgis. Bookmark the permalink.